Enjoy this double issue of The Cornerstone by clicking on an article below or scrolling down to view all! At their February meeting, the Board of Directors of Great Prairie AEA passed a resolution in support of “The Promise of Iowa” campaign. The goal of the statewide campaign is to focus attention on the future of Iowa public school students and to rally support for public education in Iowa. Board President Vicki Stephenson said the board’s support of “The Promise of Iowa” campaign is an important step in raising awareness statewide about the value of public education in shaping the next generation of Iowa leaders, workers, and citizens. 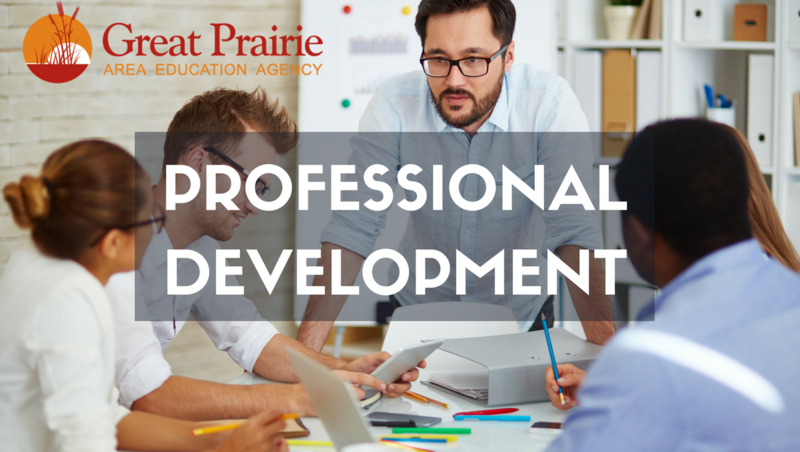 Register now for one of the many Professional Development Opportunities from GPAEA. View all in our Course Catalog. The Iowa Department of Education and Iowa School for the Deaf recognize the challenges of recruiting individuals who hold the rare endorsement of deaf education. The “Grow Your Own” program is designed to encourage licensed teachers to pursue this endorsement and help fill critical shortages in this specialized field. 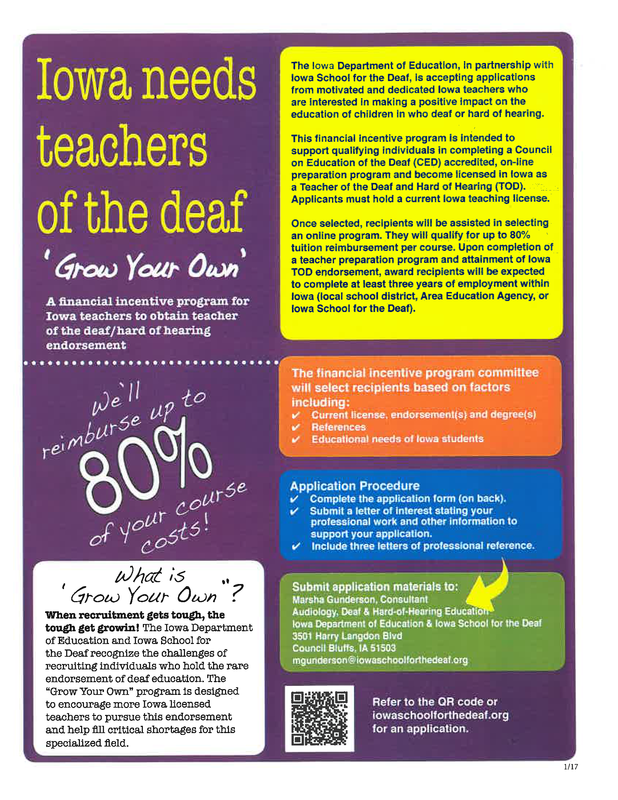 Learn more at http://www.iowaschoolforthedeaf.org/bobcat-prowler/grow-your-own-program/. Those of us who have been employed by Iowa’s Area Education Agency (AEA) system are used to the puzzled looks we get from neighbors and friends when we say that we work for the Area Education Agency — or “AEA” — system. Despite our best efforts over the last 40 or so years, too few people still truly understand the vital role that we play in helping all of Iowa’s children achieve–mostly because the majority of the time, that role is “behind-the-scenes” in local school districts. What is an AEA? Here are just a few of the ways that we are serving your community’s students. Frequently, our staff members are the ones leading the professional learning that your child’s teachers are receiving when there are “no school” or “early dismissal” days. Our staff members receive a great deal of training on best practices in teaching and learning and then work directly with local teachers to help those ideas get implemented into the classroom. Your local school district is involved in the Teacher Leadership and Compensation program which requires that lead teachers have access to high quality professional learning around improving classroom practices. 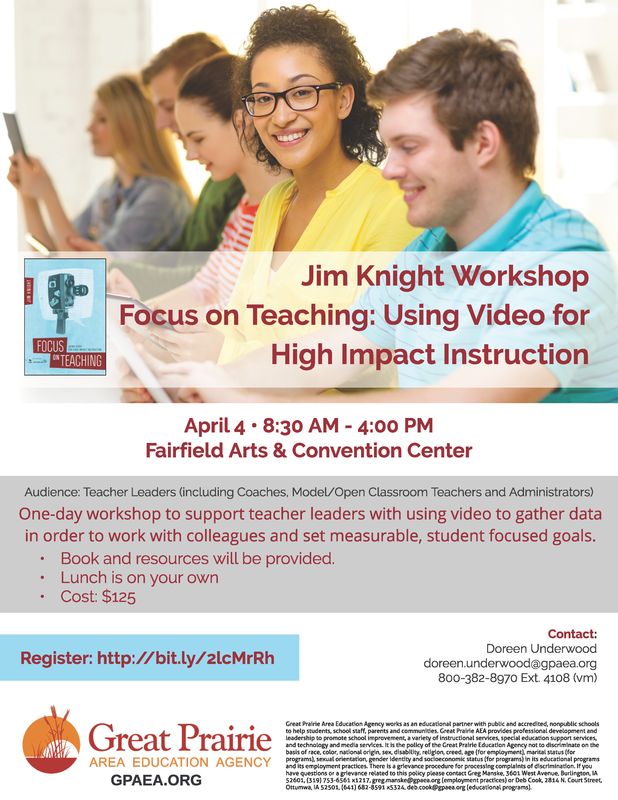 This training likely comes from your local Area Education Agency whose professional learning consultants designed a specialized plan for the schools it serves. Has your school district launched a new reading initiative? Adopted a new assessment? It’s likely that an AEA staff member may have introduced the initiative and is working quietly in the background helping to support classroom teachers with putting new strategies into regular practice. How about the students with special needs in your school district? Those students are regularly seen by AEA professionals who have master’s degrees in key areas like psychology, occupational therapy, physical therapy, speech therapy, and more. 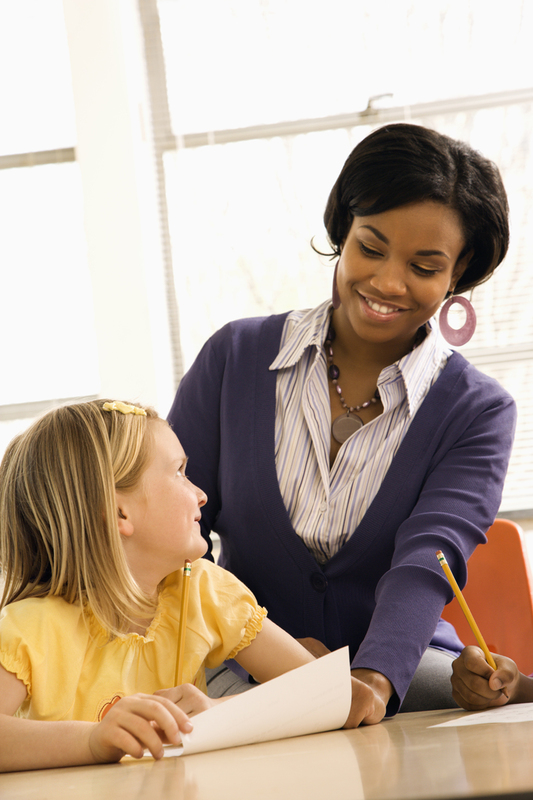 These professionals work closely with the classroom teacher to identify student-specific targets for growth and help to ensure that progress is being made so that each child can reach his/her maximum potential. However, if you don’t have a child with special needs, you would probably never even know about this important service that impacts over 8,000 children in our area of the state. Step into many classrooms today and you will likely notice a number of students-used materials like play-away books, iPads, robots, and more. Most of these materials are items that school districts could not afford to purchase on their own so the AEA purchases them and loans them out to every school district so that no child goes without the opportunity to learn from them. These are just a few of the many services provided by your local AEA. Services are funded through a combination of federal-aid and state-aid payments; legislatively controlled property tax; federal, state and private grants; and tuition for classes. Without ongoing support from these sources, the educational experience each child receives in Iowa would not be nearly the same. Local superintendents were among more than 150 education leaders at the Iowa Capitol Thursday, united in their vocation and in their request for Iowa legislators to attend to the needs of the state’s students. “Our focus isn’t just on extending our hand and requesting the state’s financial support,” said Steve Murley, Iowa City superintendent, one of the superintendents attending today’s event. “What we need is an audience with our legislators to help them understand today’s realities in Iowa classrooms. While we’re celebrating the highest graduation rates in the nation, and building our state’s next generation of leaders, we’re also facing increased transportation costs, growing disparities in home life and student behaviors from what we’ve seen in the past, and new dynamics that complicate the business of educating students. “We’re asking for Iowa’s legislators to listen with the goal of understanding, and show us that they will prioritize their support for our students. The proposed level of Supplemental State Aid will force us to look at reducing opportunities for our students, and will impact everything from staffing to programming,” he added. Wearing yellow buttons with #keepingthepromise, a reference to the statewide Promise of Iowa public education campaign, representatives from every Area Education Agency, from the School Administrators of Iowa, and from more than 150 public school districts spoke to legislators about the demands of public education and the legislators’ support of their work. 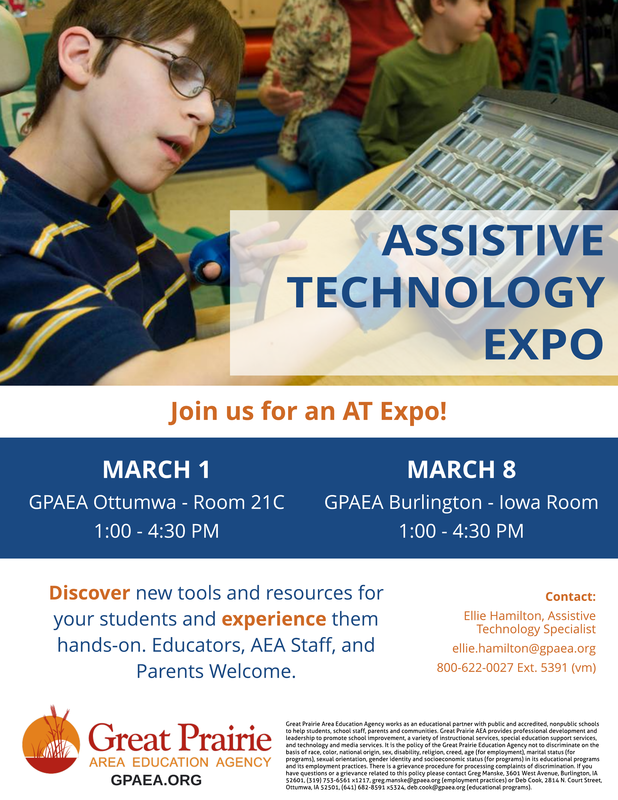 Districts from Great Prairie AEA scheduled to have representatives in attendance include Albia, Burlington, Cardinal, Central Lee, Chariton, Danville, Davis County, Fairfield, Fort Madison, Keota, Oskaloosa, Pekin, Sigourney, Tri-County, & Wayne. “With this united outreach opportunity, we welcome the opportunity to help legislatives understand the impact of their decisions on the families and children in their respective districts,” said Brent Siegrist, Executive Director of Iowa Area Education Agencies.